On this day in 1954, the Lockheed XFV had its first official flight. 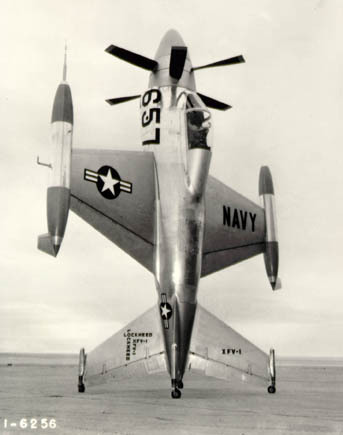 The Lockheed XFV was designed when the US Navy issues a proposal in 1948 for an aircraft capable of vertical takeoff and landing (VTOL) from platforms mounted on the after-deck of conventional ships. After a brief “hop” during taxi tests on December 22, 1953, the aircraft made its first planned vertical takeoff on June 16, 1954. The aircraft made a total of 32 flights and was able to make a few transitions in flight from conventional flight to vertical flight and back. With the realization that the VFX’s top speed would be eclipsed by contemporary fighters and that the VFX required a highly-experienced pilot to fly, the program was cancelled in June of 1955. The singly flyable prototype is currently on display at the Sun ‘N Fun Campus Museum at Lakeland Linder Regional Airport in Lakeland, Florida, and the second prototype, which was never completed, is currently on display at Los Alamitos Army Airfield in in Los Alamitos, California.